Registration is now open for 2019 Advocacy Day. Get ready to be energized, informed and prepared about Kansas issues in the 2019 Legislative Session. 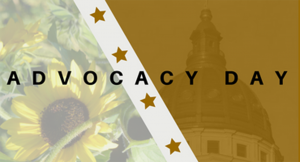 The Advocacy Day schedule is available at 2019 Advocacy Day! The speakers include Mike Munger, MD, Dodie Wellshear, Rachelle Colombo, Stephanie Sharp, Tracy Russell and legislative leaders. Following a day of learning about the issues and how to engage with legislators, you are invited to the Dillon House for a reception to mingle with legislators. This is our biggest legislative event of the year – don’t miss it!